Crowning an ancient promontory above the Saint Lawrence River, once a campsite favoured by the Native peoples, a 300-year-old chapel, a museum of history and an archaeological site invite you to hear what they have to say about the people who founded Montreal. Through the achievements of Marguerite Bourgeoys, a woman of courage and compassion who lived in 17th-century Montreal, you will find yourself transported back through time to another world, that of our ancestors. The highest view of Old Montreal from the tower of the chapel will draw your attention to today’s landscape while conjuring up that of days gone by. Imagine the old town by the river with the woods, the fortifications and the few houses that existed at the time. Think of the courage of the men and women who had to face an ocean voyage and the mighty river to begin to build a new life as settlers in Montreal. 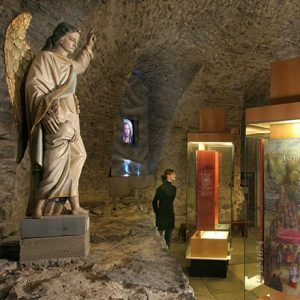 In the crypt located under the chapel, you will get a sense of the history of Notre-Dame-de-Bon-Secours Chapel whose foundation prompted the development of Montreal’s first suburb. Placed there one by one centuries ago, the stones of the vault will remind you of the labour it often takes to fulfill a dream. Access to the archaeological site is through the crypt. There you will find archaeological vestiges among the oldest in the city: the first stone chapel built by Marguerite Bourgeoys and the first settlers and, next to it, traces of an Amerindian campsite dating back more than 2400 years. In every room, the beauty of the site and the diverse collection of the museum will claim your interest. From the beginnings of Montreal to the education of the children of the colony and the Native Peoples, through the construction of a chapel and the founding of the Congrégation de Notre-Dame, the museum stands as witness to the outstanding achievements of a pioneer woman and of an entire people. 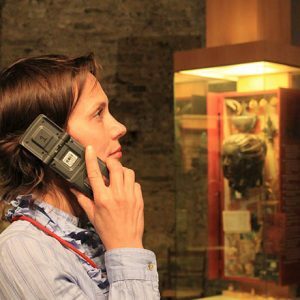 The audioguide service will make you see the Museum differently. Touring the Museum with this multimedia guide is the perfect way to learn about the life and exceptional destiny of Marguerite Bourgeoys. The Bonsecours site and its surroundings are also highlighted through an original narrative enlivened with exclusive images, stories and first-hand accounts. You could also use your audioguide to discover Notre-Dame-de-Bon-Secours Chapel, Montreal’s oldest chapel. In surroundings that have preserved the past and added a modern face, bridging past and present, the Marguerite Bourgeoys Museum will surprise you with the quality and variety of its programming, available to everyone the whole year long. We offer a wide range of guided visits for groups and education programs for both elementary and secondary school students.